For experienced and inexperienced horseback riders! Experiment the horseback emotion in a place near to dominical, uvita, ojochal in the Costa Ballena area. Horseback riding tour through a farm that borders with two amazing waterfalls of the Barucito River, near Dominical. These wonderful waterfalls are one of the main attractions of the Southern Pacific Zone of Costa Rica. Two cascades that tower 150 feet and 65 feet above a sparkling 20 foot deep pool form the falls. The horseback tour includes time for swimming, climbing the falls, jumping into the deep waters, bird watching, breakfast and lunch. The tour begins every day at 8:00am and ends at 2:00pm. Breakfast and lunch are included in the horseback tour. Tour the beach and/or the rainforest on horseback. horseback riding tour. 3 - 4 hours: snack included. 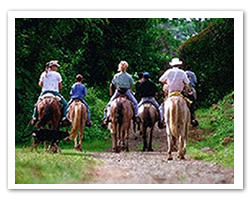 "Cowboy for a Day" with this horseback riding tour! In Rancho La Merced, (situated near Punta Uvita and Ballena Marine National Park). Here you can enjoy being a cowboy! Depending on the time of the year of your visit, you can ride with the ranch hands, round-up cattle, brand calves and cows, learn to rope calves and perform other ranch activities. 5 - 8 hours: includes breakfast and lunch. Tortuga Beach horseback riding tour. Splendid black sand beach more than 2 miles long. This horseback riding tour starts at 8:00am. 2- 3 hours. Ventanas Beach horseback riding tour . Small intimate beach with 2 mysterious caves and a coconut tree plantation. This horseback riding tour starts at 8:00am. 3 - 4 hours. Waterfall of Ojochal horseback riding tour . Visit a tropical garden on horseback. Bathe in a natural basin at the foot of the waterfall. 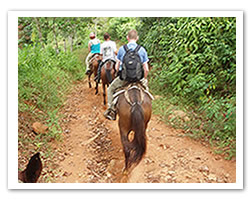 Enjoy horseback riding through a tropical jungle to observe monkeys, butterflies and flowers. This horseback riding tour starts at 8:00am. 3 - 4 hours. Las Brisas Mountains horseback riding tour. Superb horseback ride in the mountains crossing brooks, and the natural habitat for several birds, butterflies and tropical plants. It is sometimes visited by families of monkeys. Spectacular views of the mountains, the beaches and the valley. This horsebacks riding tour starts at 8:00am. 3 - 4 hours. 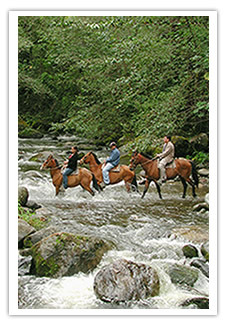 Come to Mar y Selva and enjoy the Horsebach tours.